Abstract: dditionally, the ML-1250 supports PCL6 emulation and it has also been developed to be more energy efficient than its' counterpart the ML1210. The Samsung ML-1250 is a home level 12ppm mono laser printer. With a resolution of 1200dpi and an average toner life span of 2,500 pages (at 5%) it makes an attractive option for home use. The ML-1250 connects to the computer via a USB or parallel cable offering both current and legacy connectivity. USB is significantly faster to use, but some of us still have older computers, or print servers which only support Parallel cable connections. With a 1200DPI class resolution, 4MB of fixed memory and the option to upgrade upto 68MB the ML-1250 can tackle everything from poster printing, transparencies, letters, and card stock. Additionally, the ML-1250 supports PCL6 emulation and it has also been developed to be more energy efficient than its' counterpart the ML1210. The ML-1250 is shadowed by the ML-1210 which has just about identical specs, but maintains a fixed 8MB memory module and only 600dpi resolution. Both printers are nearly identical otherwise, and well suited to the home environment. Printing Expenses: The cost of replacement toner cartridges is about $60, thus the cost per printed page sits at 2.4 cents per page. The actual yield will undoubtedly be under 2500 pages from the cartridge, but should keep below $0.034 per page if we assume a 70% yield - still providing relatively inexpensive printing. Naturally, your actual cost per page depends on what you tend to print. If you only ever print pages of text, the 5% coverage and $0.024 cost will stand more valid than if you tend to print pages from the web, or documents with many images. 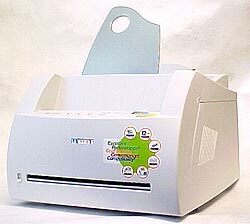 A 150 sheet paper tray at the top of the printer holds paper vertical like a fax machine or the older ink-jet printers. The ML-1250 printer doesn't come with either the parallel or the USB cable. The printer controls are dead simple and hint towards the market this printer is intended to satisfy. Aside from the power button mounted on the rear of the printer, the main bezel has three indicating LED's and three buttons. Cancel/Reprint deal with existing print jobs and allows the user to cancel a current print job or reprint the last page that was sent to the printer. Toner Save makes images and such things a bit lighter, and really works best with just text documents, helping to extend the useful life of those expensive toner cartridges. There is a sight decrease in print quality when this feature is on, and some light gray scales may not be printed at all so this feature is best left for draft copies as image quality will be lessened. When the Demo button is held for a short duration it will cause the printer to print out a test page with its current configuration: amount of memory, total number of pages printed, and several other points. If the Demo button is held for longer than 10 seconds it will prompt the printer to go through a self-cleaning operation - for example if there is excess toner on the internal roller drum. 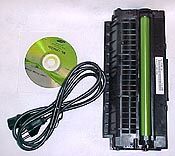 A SIMM expansion slot in the base of the printer enables the user to upgrade the printers memory with at least one 64MB memory stick. Generally, the 4MB of built in memory should be sufficient, but if you find yourself printing a lot of images, or PDF files (they can sometimes cause delays if they are image intensive) then it is a good idea to upgrade the printer to a higher class of memory. In the end, you can really have enough memory, so it is a worthy option to take advantage of.